With another building-boom year almost in the books, it’s worth taking a look at what came up, what went down and what never got off the ground in 2018. With even more plans already in the pipeline, development around the city will continue in 2019. Some squashed proposals may also gain new life with pending lawsuits and appeals to reverse the decisions. Two neighborhoods proved the epicenter of the 2018 boom, as they have in previous years. In the South End and downtown alone, 2018 meant construction and plans for more of it. Work continued on four high-rise apartment buildings that bring the decade-old Harbor Point development to near completion at the southwestern tip of the South End while the same developer, Building and Land Technology, began construction on the new 500,000-square-foot headquarters for Charter Communications. Charter is now proposing a second building, another 365,000-square feet, and BLT is pining for another high rise, this one on half of the old B&S Carting site between Woodland Avenue and Walter Wheeler Drive. Both plans are now in front of the Zoning Board. Meanwhile, just a half-mile north on Washington Boulevard, bulldozers and hardhats are taking down one of the old St. John cylindrical towers. The 16-story tower, soon to be dismantled floor by floor, will make way for another luxury apartment building, this one built by a division of the country’s largest home builder, Lennar. Behind Lennar’s incoming tower will soon come another luxury apartment complex, this one from True North and developer Steve Wise. That building will rise on the parking lot of The Basilica of Saint John the Evangelist. The True North project also calls for a public access European-style piazza addition to the church, across from City Hall. A three-block walk west from that construction site takes you to another work in progress as Ironstate Development Corp. continues to build the new 650-unit Urby luxury apartment complex next to the mall. To be fair, though, work there started in late 2017. Walk up Summer Street and you’ll hit a soon-to-be construction site. Silverback Development recently won approvals to replace the office buildings at 777 and 773 Summer St. with yet more luxury apartments. 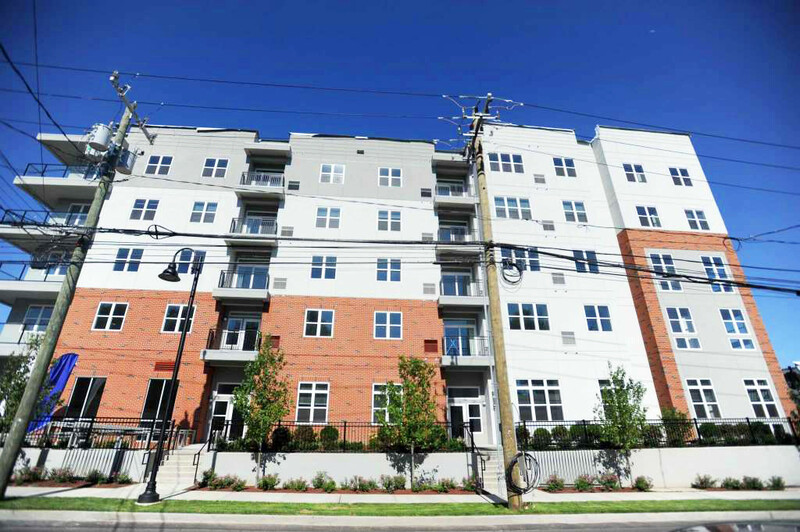 Two other luxury complexes opened downtown in 2018, bringing an additional 534 housing units on line. One was Atlantic Station, with 325 units on Tresser Boulevard, which opened early in the year. The other downtown housing high rise, the 19-story, nearly 210-unit Vela on the Park building on Washington Boulevard opened to new residents this summer. The summer also saw BLT opening a new apartment complex — Harbor Landing — across the West Branch from its sprawling South End Harbor Point development. The opening marked the builder’s first project in the Waterside neighborhood. The apartments came on line along with the new Hinckley Boatyard, a compromise replacement after BLT tore down Brewer’s Yacht Haven West in the South End. Near the Vela building, the University of Connecticut-Stamford demolished the old Bloomingdale’s parking garage and replaced it with a surface lot. And that wasn’t the biggest move in city parking: The state this year outlined its plans for a new nearly 1,000-spot garage for train station commuters on South State Street. The city also got a new park in 2018: Across West Broad Street from that new UConn lot, the Mill River Park went from mounds of dirt to a nearly complete park, even snagging a national city-planning award in the fall. The nonprofit collaborative charged with creating the park opened a new open-air skating rink this month. In all, thousands of new apartment units were either opened or approved to be constructed in the city in 2018. Then there are the projects that never got off the ground this year, but not for lack of trying. Two come to mind, each with an army of consultants, corporate denizens and attorneys plying the Planning and Zoning boards for approvals. One plan, to open a Life Time Fitness facility in a Turn of River neighborhood office park, even made it to the Board of Representatives before that board overturned earlier zoning approvals. And that story won’t end in 2018. The developer, George Comfort & Sons, is suing the Board of Representatives for the reversal. The Life Time saga — hashed out over some dozen meetings held from 2017 until late in the summer — is likely the development story of the year. The cast of characters included more than six lawyers from at least three firms and crowds that made the large City Hall cafeteria, where land-use meetings are held, feel small. On one side was a small homeowners’ group led by a retiree, Hank Cuthbertson, who hoped to maintain his quiet neighborhood. And on the other was New York City-based George Comfort & Sons and Minnesota-based Life Time, hoping to open a gym where they said no company would go — a vacant office building in High Ridge Office Park. Along the way, the fight became yet another flash point in a long simmering divide between residents and the developers that are reshaping Stamford as the city grows. At the core of the fight are the city zoning regulations. Developers say the codes need editing if the city is to remain prosperous. Residents cite the same codes as their only protection against congestion, lower property values and losing their peace of mind. Some quotes from Life Time stories over the year highlighted the chasm. “If you approve this text change, you send a message to all of Stamford that all their protections … are up for grabs,” Cuthbertson said. Comfort’s attorney William Hennessey made the development argument right out of the playbook. Although the Life Time fight was the most drawn-out development spat of the year, another failed proposal takes home the award for most upsetting to city officials. Chick-fil-A, a southern chicken sandwich chain, hoped to open a restaurant with a drive-through where a vacant bank now sits at Bull’s Head, between Long Ridge and High Ridge roads. The plan angered neighbors longing for less congested roads and drew condemnation from the city Transportation Bureau. Even Mayor David Martin weighed in, sending a letter to Zoning Board members asking them to kill the plan. “Even with the best management, a (drive-through) would substantially increase the potential for additional congestion at Bull’s Head,” he wrote. Chick-fil-A quietly withdrew its proposal after delaying hearings for several months as it tried to change the city’s mind. Chick-fil-A even prompted an overhaul of how the city zones drive-throughs, which are now only allowed in industrial zones.